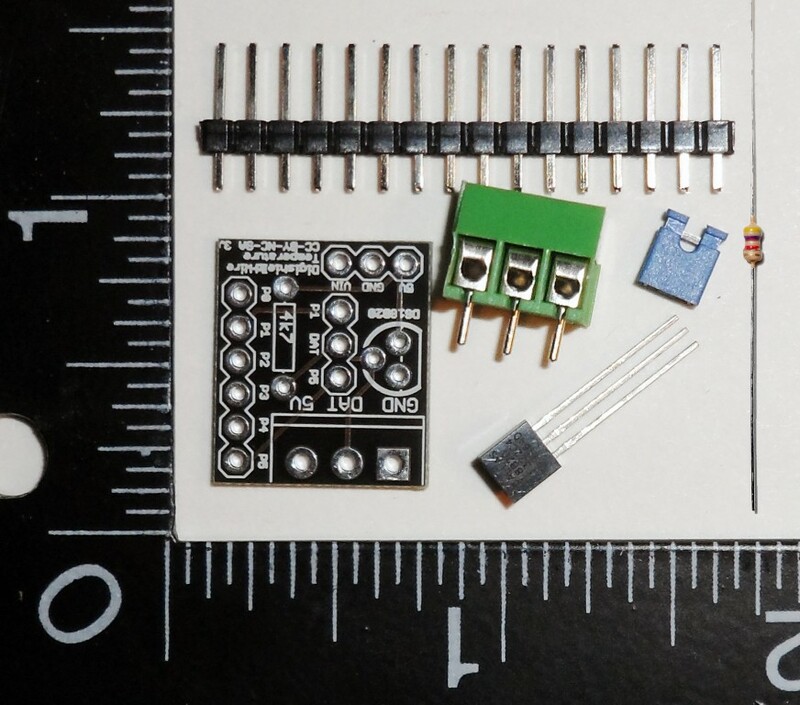 Adafruit has this excellent guide that starts with the tools needed and then shows detailed pictures, including some of the common problems that beginners experience (http://learn.adafruit.com/adafruit-guide-excellent-soldering). Empty kit bag (or if using a raw PCB, acquire parts) and verify contents. Note for Kickstarter Backers and Pre-orders: Headers are not included in each kit bag, but the entire order came with more than enough headers for all kits. 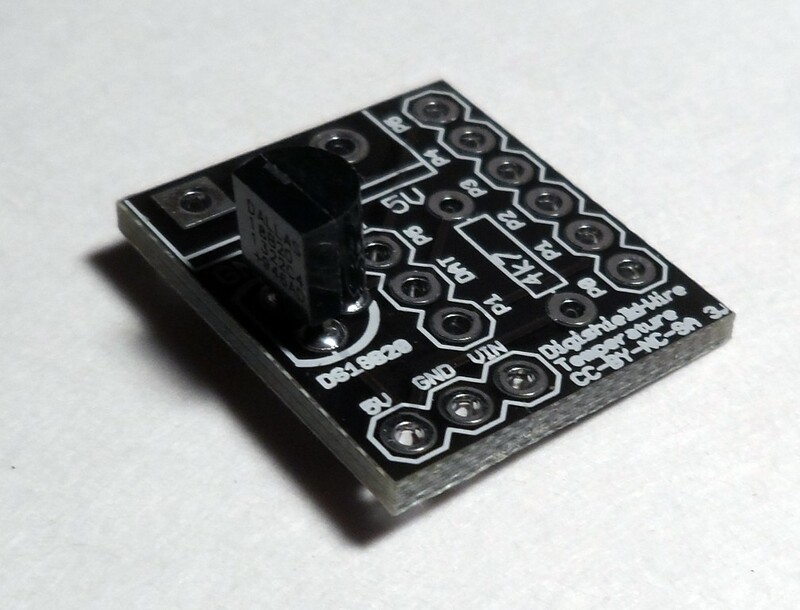 Insert the the DS18B20 Temperature Sensor, matching the shape of it with the printing on the board and solder all pins. Insert resistor. Solder the leads and clip off the excess. Cut a length of male headers 3 pins long and insert into the jumper location (labeled P1 DAT P5). Solder the pins on the back. Place the jumper/shunt on top of the pins just soldered. 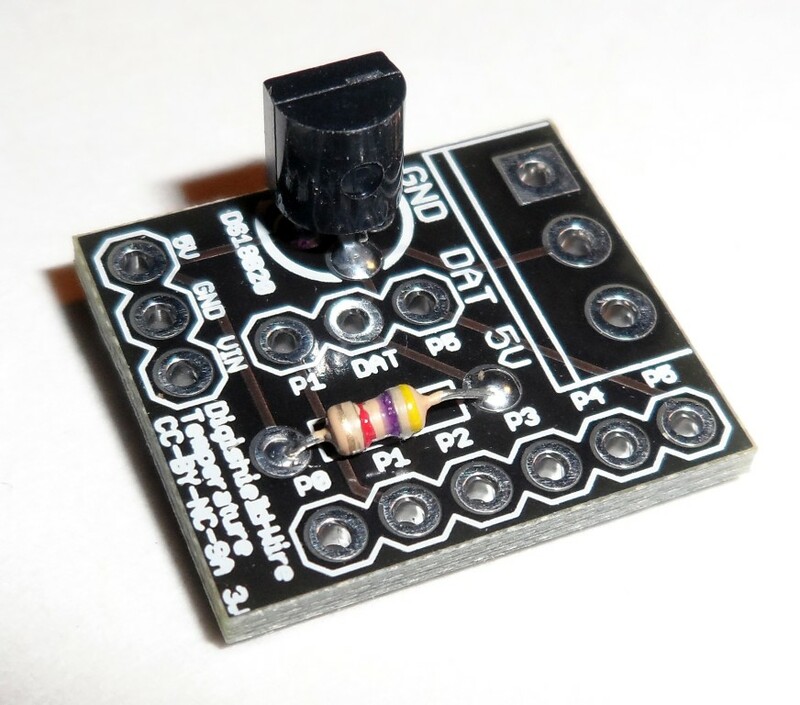 Position it over DAT and P5 or DAT and P1 based on whether you'd like to use P1 or P5 to communicate with the sensor. Insert the 3-pin screw terminal with the hookup openings facing outward. Solder the two pins. External 1-wire devices can be added to the same 1-wire bus by connecting them to the 3 pin screw terminal - following the labeled pin outs on the board. 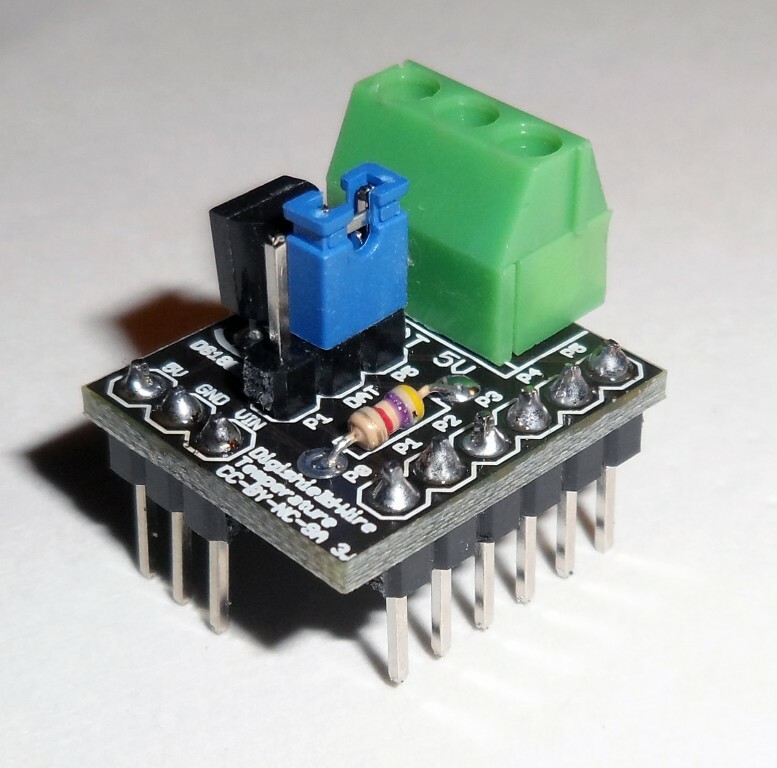 Sensors other than the DS18B20 will not be covered in the included examples, but many examples are readily available online. This tutorial demonstrates how to use the Oak to read temperature data from the DS18B20 1-Wire Digital Thermometer and publish that data to the Particle.io Dashboard log. It will also demonstrate how to use the deep sleep capability of the Oak platform to minimize power requirements (if desired) between temperature readings. Connecting the 1-Wire DS18B20 digital thermometer to the Oak platform. Publishing temperature data to the Particle.io Dashboard log. Deep sleep capability of the Oak to minimize power usage between readings. The 1-Wire DS18B20 digital thermometer can operate at either 3.3 volts or 5 volts. 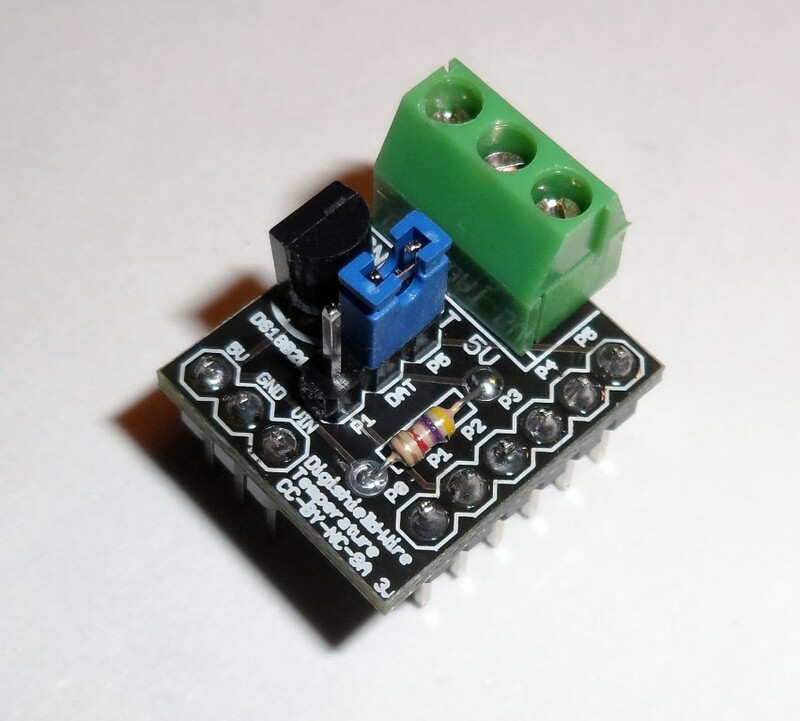 Since the Oak is a 3.3V device, we will use the Oak's 3.3V VCC pin to power the DS18B20. 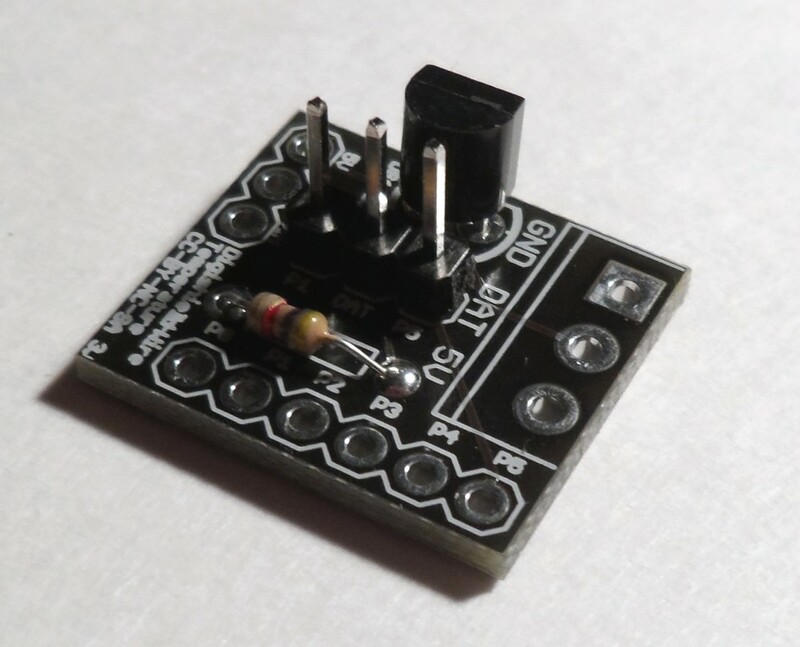 The DS18B20 device Data Input/Output lead (DQ) is pulled up to 3.3V using a 4.7K resister. While the DS18B20 does support a parasitic mode, this mode will not be demonstrated in this tutorial. 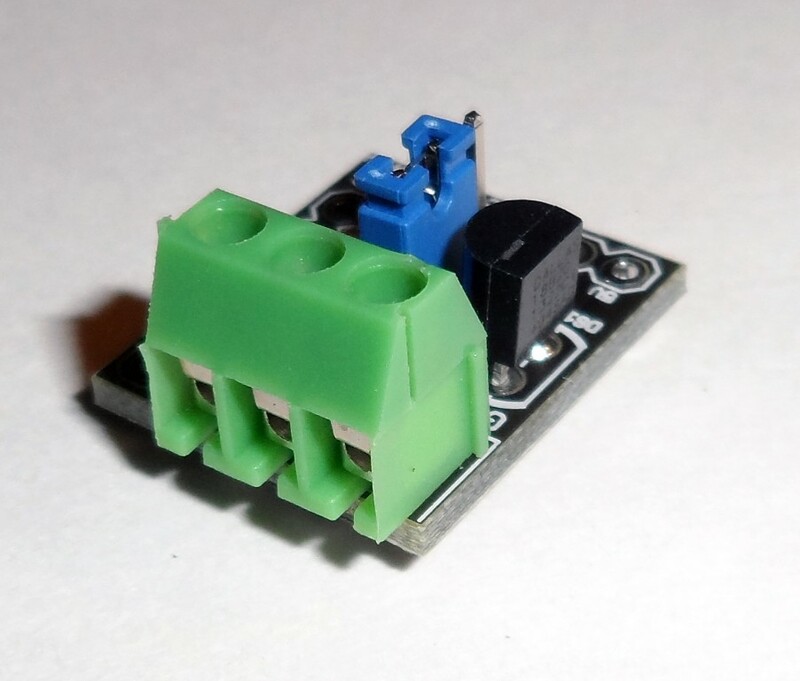 Parasitic mode does not require the DS18B20 VDD lead to be connected to external power, but it does require a strong pullup on the 1-Wire bus. To learn more about operating the DS18B20 in parasitic mode, see the DS18B20 device data sheet (https://datasheets.maximintegrated.com/en/ds/DS18B20.pdf). Temperature is read using the getTemp() function from the standard DS18B20 example sketch. The only changes made to getTemp() are the conversion of temperature to Fahrenheit and modified return errors. The example sketch (see below) uses the Particle.io function Particle.publish() to post temperature readings to the particle.io Dashboard log. In order to do this you must have an active Particle.io account, a functional Oak running the latest firmware, and the Oak claimed as an active device on Particle.io. The actual command used is: Particle.publish(“Temp (F)”, tempFstring, 60, PRIVATE); where “Temp(F)“ is the event name and tempFstring is the actual temperature reading in string format. The Oak is capable of entering a deep sleep to minimize power requirements. This may be desirable if, for example, your Oak will be battery powered. The sketch demonstrates this mode of operation but also supports operating in a non-sleeping mode. To indicate to the sketch that sleep mode is desired, we use pin 5 (pulled HIGH) as essentially a “switch”. If pin 5 is read HIGH in setup(), the sketch operates in sleep mode. For this example it is considered to be the default operating mode. As such, pin 5 is defined as INPUT_PULLUP to facilitate this default mode of operation. To facilitate the Oak's deep sleep and wake-up capabilities, you must also connect pin 10 (WAKE) to the reset pin (RST). This allows the Oak to trigger a RESET when a user specified sleep period has expired. While in sleep mode, the sketch enters and runs setup() each time a RESET occurs. This mode never enters loop(). If you prefer to operate the Oak in non-sleep mode, or if you want to prevent it from sleeping (when in sleep mode) to allow for new sketch uploads, pin 5 simple needs to be connected to ground (GND) thus pulling pin 5 LOW. When pin 5 is LOW the sketch will not sleep and will enter loop() where it remains until a power cycle or reset occurs. While in loop() temperature is repeatedly read from the DS18B20 device and published to Particle.io. A delay is used to take readings at a user defined interval. This mode consumes more power than it does when operating in a sleep mode. If pin 5 is HIGH at power up (sleep mode), the sketch stays in sleep mode as long as pin 5 remains HIGH. If at anytime pin 5 is pulled LOW, the sketch will enter non-sleep mode after the next RESET. Once it enters loop() in non-sleep mode, it remains in loop() as long as the Oak is powered up regardless of the state of pin 5 (HIGH or LOW). In Sleep Mode (after reading and publishing temperature data) the Oak enters deep sleep and delays for a user specified number of seconds. When sleep time has expired, a RESET is triggered via pin 10 (WAKE). Following a RESET, the sketch starts from the beginning and never enters loop(). // We are here because Non Sleep Mode selected. // Will remain in loop() until a reset or power cycle occurs. Note the addition of the Blue wire connecting pin 5 to ground. In non-sleep mode the Oak enters setup() and reads pin 5 to determine the desired mode. Since pin 5 is pulled to ground (LOW) the sketch will enter loop() where it continually requests temperature data from the DS18B20 and publishes that date to the particle.io Dashboard log. Data is requested at intervals set by “sleepTimeS” which specifies the number of seconds to delay between readings. If the Oak was started in Sleep Mode (pin 5 HIGH), it can be forced into non-sleep mode by simply connecting pin 5 to ground. At the next wake-up / reset, the sketch will see pin 5 high and enter Non-Sleep mode. This mode will allow new sketches to be uploaded. periodic calls to particle.Publish() to log temperature readings. else you will enter and endless sleep. * Watches Sleep_pin to determine whether or not to go into deep sleep. 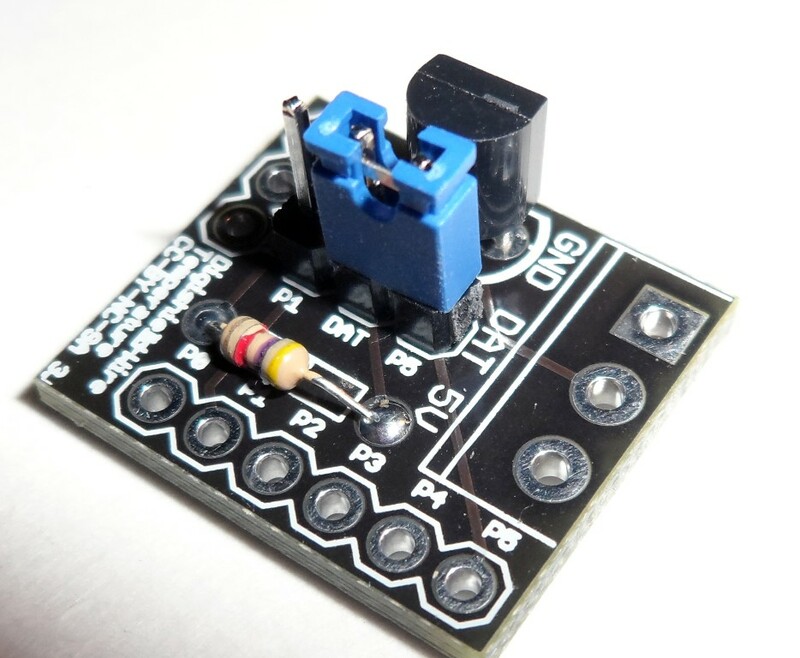 This tutorial demonstrated how to connect and read temperature data from the DS18B20 thermometer. It provided an example of how to publish that data to the Particle.io Dashboard log. And finally, it demonstrated the deep sleep capabilities of the Oak. While the example may be more complicated that necessary, it does serve as a useful example for creating new sketches using the Oak platform. Please feel free to use and modify this example to create your own sketches on the Oak platform. We hope that you have found the tutorial to be both useful and informative.